Richard D James, aka Aphex Twin, has announced his first album in 13 years, SYRO. The follow-up to 2001’s Drunkqs (or 1994-via-2014’s Caustic Window if you want to count the Kickstarter-funded release) has been secretly advertised the past few days with Aphex Twin’s logo appearing on a neon green blimp flying above south London and stenciled on pavement at various locations in New York City. Aphex Twin being Aphex Twin decided to make the announcement in the most Aphex Twin of ways. At 4 PM today, James tweeted a link that was solely accessible through Tor, a browser designed for accessing the deep depths of the web (basically sketchy parts of the internet that Google deems pointless to track). 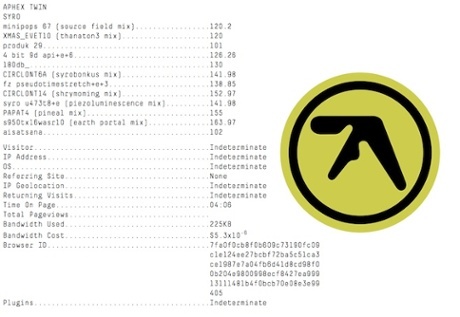 That link led to a page with Aphex Twin’s logo and the album’s title, tracklist, and more. As Pitchfork confirms, all of the information in the Tor link about SYRO is official and correct.